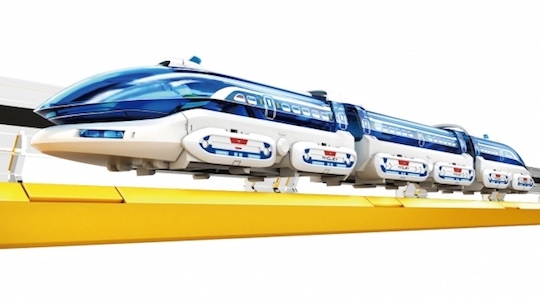 Maglev Toy Train - Moar Stuff - You don't need it but you know you want it. This Maglev Toy Train is modeled after Central Japan Railway’s L0 superconducting maglev train and uses real magnetic levitation technology to float 2 mm above the tracks. This tech allows it to run much faster than previous toy trains. In fact, it can reach scale speeds of 310 MPH (500 KPH)! Try that with your old HO Lionel train set and see what happens. Maglev works by setting magnets with opposing poles against each other. Since opposing poles repel, the train floats! By rapidly turning on and off a set of propulsion magnets the train is pulled along the tracks. Since there is very little friction (and no wheels to hit bumps in the track), the train can get up to very high speeds and still provide a very smooth ride or, in this case, not go flying across the room. This train offers speed sensors and voice announcements as it hovers and races over the tracks, which includes a train station, bridge and a tunnel. This Maglev Toy Train set would be great for model train collectors or people looking for an engaging STEM toy for their kids. Power: AC adapter, AA batteries (x 10), Lipo battery (internal). Includes: train, control station/charging point, straight rails (6), half rails (2), curving rails (8), bridges legs (18), straight tunnel, curving tunnel, bridge. Instructions: Japanese. Yeah, you’ll probably need Google Translate for that.